Campari Group, trading in over 190 countries around the world with leading positions in Europe and the Americas, today is the sixth-largest player worldwide in the premium spirits industry. With a portfolio of over 50 premium brands, the Group's key focus includes Aperol, Appleton Estate, Campari, SKYY, Wild Turkey and Grand Marnier. 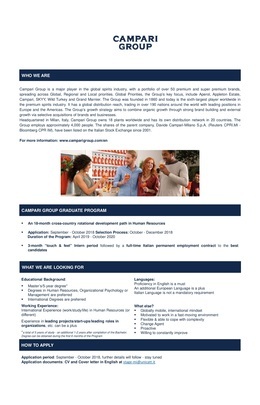 Campari Group is launching the Campari Group Graduate Program, a 18-month cross-country rotational development path in Human Resources. 3-month "touch & feel" intern period followed by a full-time Italian permanent employment contract to the best candidates. For more information on educational and professional requirements click here.